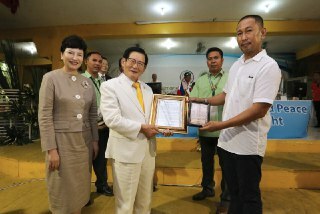 of HWPL to End 40-year Conflict in Mindanao, Philippines. On May 25th 2015, Esmael “Toto” G. Mangudadatu Governor of Maguindanao passed the legislation to proclaim January 24th of every year to be remembered and commemorated as ‘HWPL day’ of Maguindanao, a day of peace. ‘1.24 Mindanao Peace Agreement day’ or ‘HWPL day’ in Maguindanao, Philippines aims to commemorate the historic moment of signing peace agreement between Catholic and Islam representatives mediated by Chairman Man Hee Lee of HWPL to end 40-year conflict in Mindanao. Afterwards, the street once filled with pains and sorrow, was then filled with laughter and joy of 3,000 youths marching for the International Peace Youth Walk Festival. Legislation of January 24th as ‘HWPL day’ is the extension of designating HWPL day in many regions around the world like Carson and Alexandria cities in United States and Bafokeng nation in South Africa. Acknowledging the work of peace HWPL is pursuing to truly bring World Peace, many regions are joining to legislate ‘HWPL day’ to celebrate a day of peace. Designation of January 24th as ‘HWPL’ Day in Maguindanao, Philippines.